All are full frame (except for the one marked cropped), using my reverse 50 setup with tubes and the Sigma 150. Handheld. Impressive! Even if flash froze the movement you must have very steady hands to have framed just the eyes! Very cute, I like the first for the composition, the second for detail. The rings in the eyes are very interesting. I always like to imagine the view these guys have! Talk about the perfect predator, those two huge front facing eyes, and more all round the head for (I would imagine) a true 360 degree view! Could you provide a little more info on your lens setup, how much extension are you using, and presumably it's setup in this order; camera, extension tubes, sigma 150mm normal way round, reversed 50mm? Wow i've just seen these,very impressive! 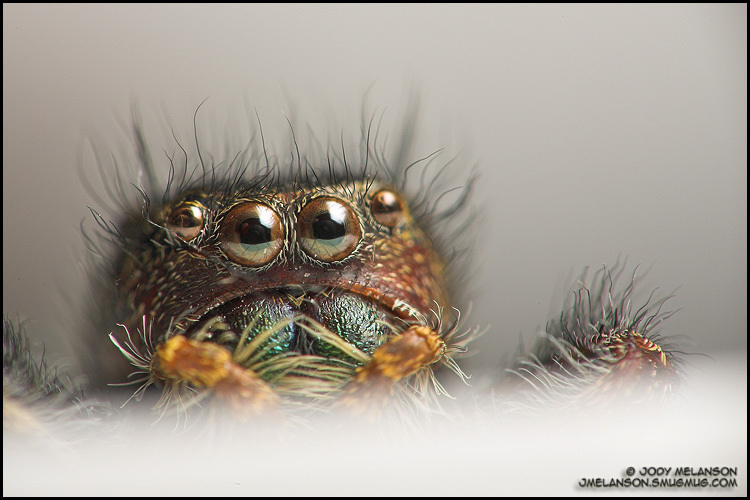 Is it me or does this spider appear to have pupils just like our eyes? 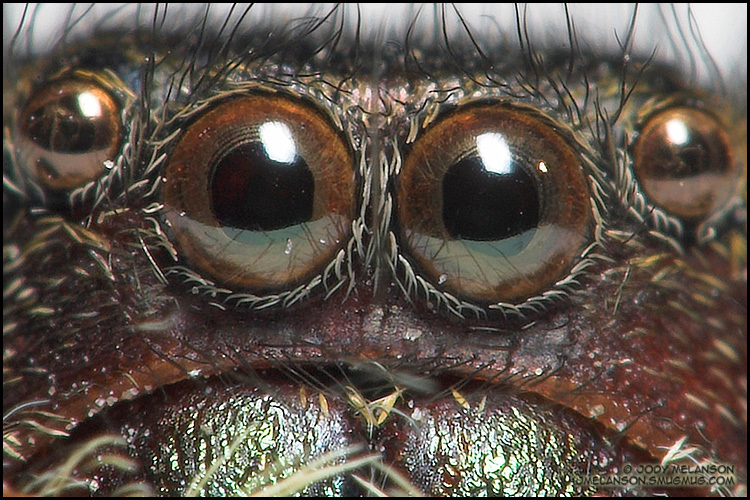 Is it me or does this spider appear to have pupils just like our eyes? Some months ago, I got curious about this spider's appearance and sent email to a couple of spider experts. The spider is dead. You don't see the black and brown like this when you look into the eyes of the live spider, but I have seen the rings like this in dead spiders that are partly or completely dried. This doesn't look completely dried, as far as I can see. It's a bit hard to guess how the soft parts inside the eye would change after death, but one guess is that the tubular walls of the eye contract inward toward the centre of each eye, thus becoming this brown rim. 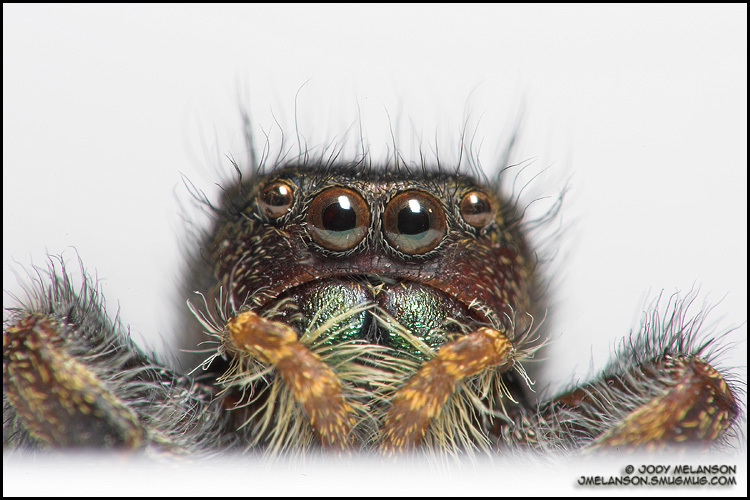 You can see black and brown in the eyes of a live salticid but it has to do with looking into the walls versus the retina, and it changes as the eye moves; it's not simply a black dot and brown rim. I cross-checked with Jody Melanson, who confirmed that the spider was in fact several months dead. This sort of thing is one of the reasons why we now strongly encourage posters to say so in the post, whenever a specimen is dead, anesthetized, restrained, or otherwise not exhibiting normal behavior and appearance. Fantastic photos! He sure loooks alive and menacing. I'm glad to not be a helpless victim to something like this.